JANICE LEE is the author of KEROTAKIS (Dog Horn Press, 2010), Daughter (Jaded Ibis, 2011), Damnation (Penny-Ante Editions, 2013), Reconsolidation (Penny-Ante Editions, 2015), and The Sky Isn't Blue (Civil Coping Mechanisms, 2016). She also has several chapbooks Red Trees, Fried Chicken Dinner (Parrot/Insert Press, September 2012), The Other Worlds (Eohippus Labs, June 2012), and The Transparent As Witness (Solar Luxuriance, 2013), a collaboration with Will Alexander. She currently lives in Los Angeles where she is Editor of the #RECURRENT Novel Series, Assistant Editor at Fanzine, Executive Editor at Entropy, and Founder/CEO of POTG Design. 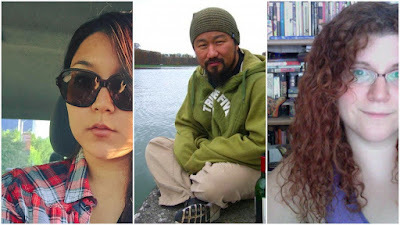 CHIWAN CHOI is the author of two collections of poetry, The Flood (Tía Chucha Press, 2010) and Abductions (Writ Large Press, 2012). His two most recent projects are Ghostmaker, a book he wrote, presented, and destroyed in 2015, and The City is My Book, a novel to be written on a series of utility boxes in downtown LA in 2016. He is also currently working on a new collection of poetry to be published by CCM in 2017. Chiwan is also one of the founding partners of Writ Large Press, an indie publisher that uses the book to resist, disrupt, and transgress. SARA FINNERTY has essays and stories in Black Warrior Review, Brevity, Longreads, Joyland, The Nervous Breakdown, Fanzine, The Weeklings, Dame, and others. She is the co-curator of The Griffith Park Storytelling Series and Sunday Editor at Entropy magazine. Sara is originally from Queens, NY and lives in Los Angeles with her husband and daughter. Find her at www.sarafinnerty.com. thanks, your articles really helped me !